To promote progress and enhance the lives of people and animals by using the practice of veterinary medicine. We will strive to exceed your expectations by providing friendly service, practicing with strong ethics and character, and utilizing current knowledge and experience to problem solve. Our valued staff is committed to earning your trust and keeping it for a lifetime by working together as a team with a spirit of optimism, creativity, compassion, and resourcefulness. 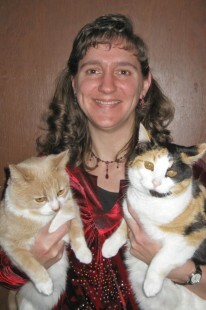 Dr. Christine Fortin finds enjoyment providing ambulatory service in a mixed animal practice. Her special interest is in equine lameness, internal medicine, and reproduction. 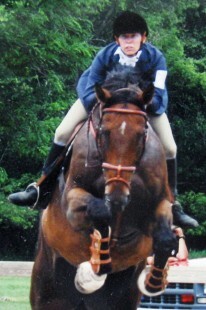 While enjoying all aspects of horse health care, she finds serving the performance horse industry especially rewarding. This includes endurance, harness, and Thoroughbred racing, as well as dressage, working cowhorse, and reining competitors. Dr. Fortin was born and raised on a cow-calf operation in East Central Iowa. She and her two younger sisters spent many hours in the saddle checking stock cows, treating calves, repairing floodgates, and competing in local equestrian events. She became an Iowa State Cyclone and obtained her Bachelors degree in Animal Science. During veterinary school, Dr. Fortin completed a preceptorship at the Marion duPont Scott Equine Medical Center in Leesburg, Virginia. After graduating from Iowa State College of Veterinary Medicine in 1989, she practiced at Annabessacook Veterinary Clinic in Monmouth, Maine. In 1990 she married David, and returned to the Midwestern Heartland. 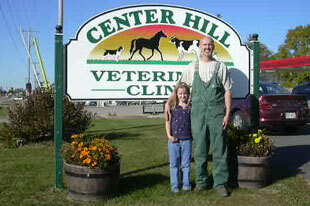 Center Hill Veterinary Clinic was founded in the fall of 1991. 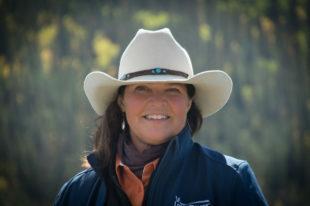 Dr. Christine Fortin, her husband, and their two children reside on Silent Hollow Farm with their Border Collie, Wirehaired Pointing Griffons, American Quarter horses, and Angus cattle. They enjoy trail riding, reining and working cowhorse competition, raising Angus cattle, gardening, music, and family time. Dr. Fortin is a member of the American Veterinary Medical Association, American Association of Equine Practitioners, Wisconsin Veterinary Medicine Association, National Reining Horse Association, and the American Quarter Horse Association. She also serves on the Wisconsin Equine Practitioners Association Foundation Board, Lafayette County Public Health Board, and the Wisconsin Veterinary Medicine Animal Welfare Committee. Dr. William “BJ” Jones obtained his veterinary degree from the University of Madison- Wisconsin in 1997. Prior to earning his veterinary degree, BJ attended the University of Wisconsin – Madison where he obtained his Bachelors of Science in Meat and Animal Science. He also graduated from the University of Minnesota with his Masters of Science degree in Dairy Cattle Breeding and Statistics. Dr. Jones specializes in advanced reproductive technology and dairy herd management. These include reproductive ultrasound, fetal sexing, embryo transfer, dairy records analysis and management. Dr. Jones lives with his wife and family in rural Darlington where they breed and raise Polled Herefords. BJ also enjoys sports, youth hockey, showing Polled Herefords, and spending time with his family. Dr. Jones is a member of the American Veterinary Medicine Association, Wisconsin Veterinary Medicine Association, American Association of Bovine Practitioners, American Hereford Association, Wisconsin Livestock Breeders Association and the Wisconsin Hereford Association where he is the state advisor to the Wisconsin Junior Hereford Association. Dr. Garrett Blumer graduated from the School of Veterinary Medicine in Madison, WI in 2015. He joined Center Hill Veterinary Clinic in 2017. Garrett grew up in nearby Monroe, WI on a dairy farm. His parents remain on the family dairy and utilize robotic milkers. Dr. Blumer has a special interest in dairy herd health. He is highly skilled with his ultrasound and has current knowledge of the latest reproductive techniques available. Garrett is a skilled surgeon and internal medicine diagnostician. Garrett holds memberships in the American Veterinary Medical Association, Wisconsin Veterinary Medical Association, Southwestern Wisconsin Veterinary Medical Association and the American Association of Bovine Practitioners. 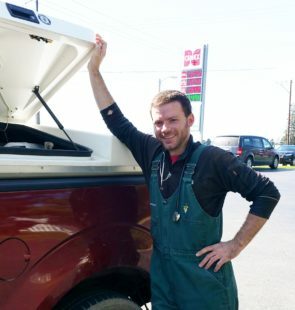 In his spare time, Garrett enjoys hiking, bicycling, downhill skiing and being with family. Dr. Cheryl Loken graduated from the School of Veterinary Medicine in Madison in 1992. She joined Center Hill Veterinary Clinic in 1996 as a part time small animal veterinarian. She holds memberships in the American Veterinary Medical Association, Wisconsin Veterinary Medical Association, Southwestern Wisconsin Veterinary Medical Association, and the American Association of Feline Practitioners. Dr. Loken is a Darlington native as is her husband, Rick. They have two children and their household also includes three cats – Harmony, Cutie, Kitty Kane, Calico and one Beagle named Nala. Dr. Loken enjoys bicycling, hiking, watching movies, playing with the Argyle and Monroe City Bands, and leading praise songs at church. Dr. Meegan Ritchie graduated from University of Wisconsin Madison School of Veterinary Medicine in 2001. 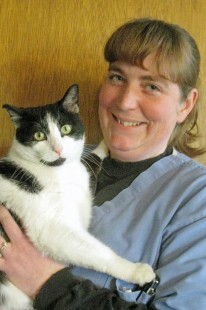 She joined the Center Hill Veterinary Clinic family in the spring of 2002. Growing up on a dairy and horse farm in southwest Wisconsin cultivated her desire to become a large animal practitioner. Her passion for horses began at age three thanks to a chubby Shetland pony. She continues to indulge in the wonderful addiction both at work and play. She enjoys the day-to-day challenges of equine and bovine ambulatory service. Such a diverse working environment has led to special interests in neonatal care, internal medicine, and soft tissue surgery. One of the best parts of her job are the relationships she develops while helping people help their four legged friends. Dr. Meegan lives in Darlington with her supportive husband Lucas. He has been very understanding about late night phone calls, offensive laundry and unusual requests for assistance. They share their home with a dog named Porter and two cats, Ryder and Louie. In her free time, Dr. Ritchie enjoys the thrill of barrel racing and the challenges of three-day eventing. Dr. Ritchie is a member of the American Veterinary Medicine Association, Wisconsin Veterinary Medical Association, and serves on the Wisconsin Equine Practitioners Foundation Board. Michelle is a Certified Veterinary Technician at Center Hill Veterinary Clinic and started at the clinic in August of 2002. She attended college at Madison Area Technical College where she received her Associates degree in Animal Science. She is a member of the Wisconsin Veterinary Technician Association. Michelle grew up in the nearby city of Mineral Point. She currently lives in the small town of Mifflin with her husband Chris. Chris and Michelle own an ambitious Weimaraner named Riggs. Michelle’s hobbies include volleyball, mud volleyball, four wheeling, and being outside. She enjoys her career even when it gets crazy and stressful. She especially enjoys the excitement of a C-section. Tonya Crosby moved to Darlington 12 years ago from Albany, Wisconsin. Tonya met her husband Fritz and married in 2007. She has three children, a dog named Peanut, and adopted a cat named Stripes! 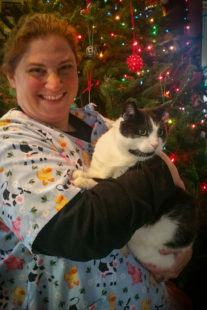 Tonya answers the phone and conducts the orchestra at Center Hill Veterinary Clinic. Her calm, methodical manner can be reassuring when you need it most. She enjoys helping all of the different animals she connects with every day but also loves how Center Hill Vet staff treat each other like family. Tonya is an active volunteer on our local ambulance service. She completed her training and became a Certified Emergency Medical Responder for Darlington and the surrounding areas. In her spare time Tonya enjoys hanging out with family and friends playing games, camping with family, working part time as a bartender, and assisting a local farmer with her livestock. Emily graduated from Argyle High School in 2012 and started working at Center Hill Veterinary Clinic in 2015. Emily has a passion for animals and cares deeply about their well being. She has worked at Center Hill Veterinary Clinic in the capacity of veterinary assistant, front desk receptionist, and is currently our bookkeeper. She grew up on a dairy farm where her father worked and also worked on several horse farms throughout her school years. She loves travel, photography and animals, especially horses and dogs. In her free time Emily likes to ride her Missouri Fox Trotter, Duncan, and hike with her German Shepherd, Arkin. At Center Hill Veterinary Clinic you will find Emily working on the computer, paying the bills, helping with equine dentistry, and assisting Center Hill Veterinary Clinic clients and veterinarians with a variety of needs! Emily graduated in 2017 from University of Wisconsin-Platteville with a degree in Dairy Science. Emily grew up in rural Platteville and has experience working on multiple dairys and set-ups. She has assisted with dairy herd reproductive management, cell count management, and raised replacement calves. Emily did her undergraduate research in colostrum quality and passive transfer. She also has training in artificial insemination through Accelerated Genetics, and received Professional Dairy Producers of Wisconsin herdsman training. 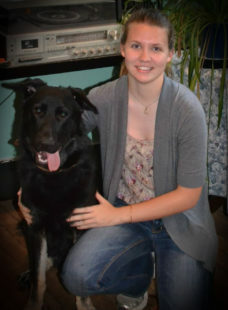 We are proud that Emily has recently chosen to advance her education by attending veterinary technician school in Iowa. In Iowa, Emily was voted 2019 President of the Veterinary Technician Club. She is also a student representative of the Northeastern Iowa Community College advisory board. 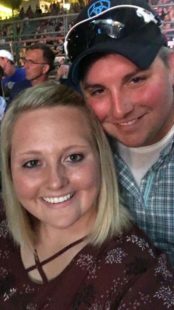 Emily enjoys her spending her spare time going to dirt track races, enjoying the outdoors, as well as caring for her dogs. At Center Hill Veterinary Clinic you may find Emily answering the phone, working on the computer, and assisting clients with their questions and needs. We are glad to have her on our team! Holstein is the clinic cat. He is 8 years old. Holstein came to the clinic when he was just a kitten. He was a stray that was living on Dr. Ritchie’s street. One morning Dr. Ritchie came out and thought she had chased all of the kittens out from underneath her vet truck. She did not know one had sneaked back under her truck. He was very smart and climbed up on her spare tire. When she arrived at the clinic, Holstein climbed out from underneath and soon was a permanent resident of Center Hill Veterinary Clinic. Holstein enjoys his naps in the window with the sun beating down upon him. He also is a big fan of catnip, which we need to keep locked up or he would eat it all. 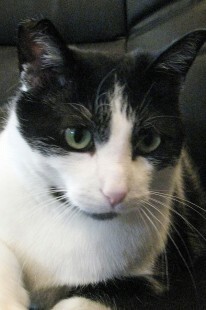 He has a large appetite, which has created clinic challenges with respect to dog and cat food storage. Holstein has many fans; our clients enjoy seeing him and frequently ask his whereabouts when he is not out front.